You can stop biting those nails, this trial is over. After a very long and strenuous battle for a hefty $6 million, Nicollette Sheridan’s case against ABC and the creators of Desperate Housewives was declared a mistrial. Well, it appears that this phase of the battle is over and done with. 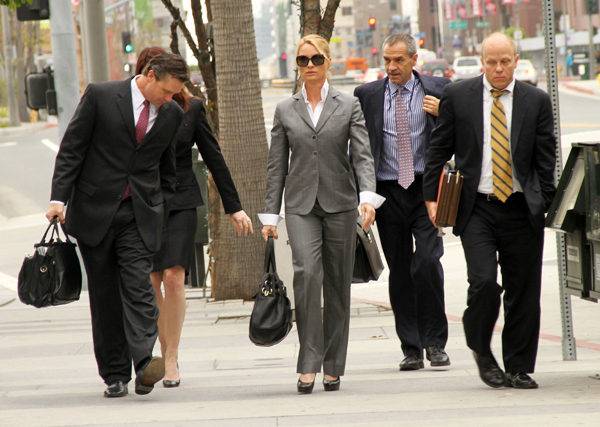 Nicollette Sheridan’s grand and prolonged $6 million trial of wrongful termination against the creators of Desperate Housewives was declared a mistrial today; the jury was deadlocked 8-4 in her favour (at least nine are needed to declare a verdict). The actress initially piled up the accusations for her character being brutally killed off the show; the colourful array of allegations started with discrimination against age, gender, sexual orientation and finally a battery claim against creator of Housewives – Marc Cherry. All those allegations were thrown out of court. Finally, Sheridan claimed wrongful termination; alleging that Cherry struck her after an on-set dispute and scripted her demise when she complained to ABC. The jury admitted that her death was peculiar, considering that killing off major characters in a successful series is rare. And the manner of her demise just smells of revenge and bitterness; Sheridan’s character Edie quite epically perishes by strangulation, car crash and electrocution due to a fallen power line. Seems a little dramatic, no? ABC claims that the death was planned since 2008, prior to the incident. The confounded jury could not come to a decision and so this ordeal is over… For now. Sheridan’s attorney assures us that the actress will plead her case again in the near future. Oh, joy to the world. Hollywood really lacks drama, so this was a good solid hit of it.